London Green Party is selecting who is to be our Mayoral candidate in 2012. There are three candidates for the job Shahrar Ali, Farid Bakht and Jenny Jones who all very kindly agreed to answer some of my questions. Here is what Shahrar has to say. If you had to choose one campaigning priority for the Green Party Mayoral campaign, what would it be? GREEN JOBS. It’s more difficult than ever for people either to find work or to keep their job. Our answer is to roll out training and employment in sustainable industries, such as decentralised renewable energy schemes, repairing stuff, and home insulation. This agenda speaks to both the climate change emergency and the creation of jobs with a social purpose, sometimes through redeployment. We can advertise the progressive policies Greens have fronted, such as Jean on work-life balance and Darren and Jenny on the London Living wage. We are also part of the anti-cuts movement which seeks to protect jobs in the public sector, such as local library provision, without which the life chances of some of the most vulnerable and most disadvantaged in society will be unconscionably set back (see my letter, “Libraries are essential”). How do you see the role of the Mayoral candidate in relation to the Assembly campaign? HIGHLY CONSEQUENTIAL. Previously there’s been greater focus on the Mayoral contest than the Assembly constituency and list selections. As your mayoral candidate, I’d showcase Green campaigns and successes across the London boroughs, alongside our GLA candidates, and regularly remind voters of the need to vote in the proportional elections. Let’s get more Greens elected than ever before! How should we politically approach Ken Livingstone bid to become Mayor again? SELF-DISCIPLINE NOT SELF-INDULGENCE. 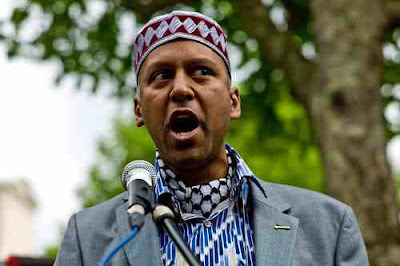 I would advocate the approach, as your representative, that London Green party members decide upon – in terms of second preferences or none, at a time of our choosing. There is a strategic side to this, so it’s not just a question of my declaring my personal preferences ahead of time. What I can say is that, with your mandate, I’ll hold my own in any public meeting with Ken and Boris, and won’t give an inch. Here’s a recent question to Boris at People’s Question Time on the woeful state of London’s tubes (and I challenged Ken on cronyism in public appointments, in an exchange of press letters in 2005). What is the most fun part of campaigning for you? Meeting new people, anticipating or vocalising their concerns and SEEING POSITIVE RESULTS. On road safety, for example, we campaigned for two years locally to get Asda to redesign their loading bay and put a stop to lorry drivers endangering pedestrians by parking on a crossing. It was very rewarding to finally get action on this and for Greens to be rightly credited for it, see “Green Party declares victory in ASDA delivery lorries row”. What would be your top tip to someone who is just starting to get active in the Green Party? STAND FOR THE NEXT LOCAL ELECTIONS! And help others get elected elsewhere! As campaign coordinator for last year’s local elections in Brent, I’ve already popped the question to many an aspiring Green and often received the right answer. We stood a record 62 candidates in 2010, with good balance in terms of both gender and diversity, too, for which we got heightened publicity and credibility. 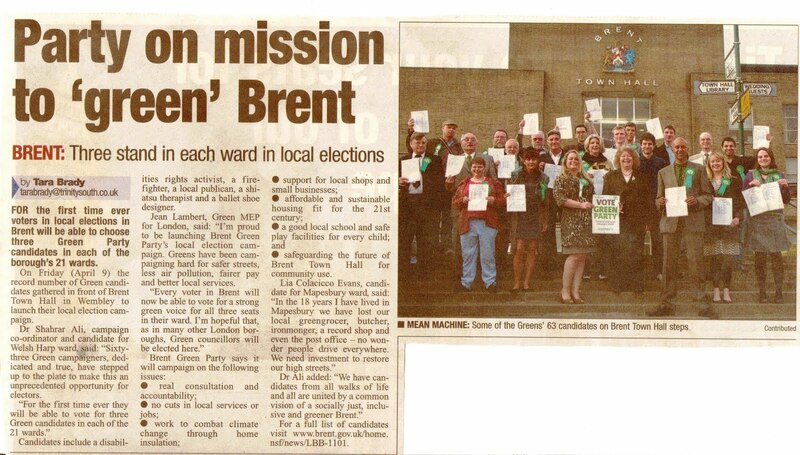 See headline article “Party on a mission to Green Brent”. As local party support, I’ve also proactively supported candidates in neighbouring local parties (see Susanna Rustin’s article, “My first election as a Green Party candidate”). We need to make sure that all those Londoners who voted for us last year and before are ready to come back for more, and then some. For that you need a mayoral candidate who understands and respects the internal democracy and accountability of the party, with a track record of promoting green politics through public speaking, electioneering and campaigns year in year out!